The Compass Web StoreFront is a complete, data-driven, web-based e-commerce package based on SiteBuilder and fully integrated with the Compass Business Management System. The site provides resellers all of the tools necessary to promote, communicate, and sell products using the power of the Internet. The site includes all of the major features customers have come to expect from professional sites managed by leading e-tailers. The site design is graphically interesting and inviting, offering the ability for webmasters to change the layout without programming knowledge. First-time visitors and experienced customers, alike, find the site navigation to be quick, easy, and intuitive. Site elements are useful and informative. The Product Catalog, Search tools, FAQ, Shopping Cart, and Account management are powerful yet practical. Unlike traditional web shopping carts that require your staff to have programming knowledge to change even basic elements, the Compass Web StoreFront puts the power in your hands, without the need for programming. Site colors, fonts, content, and available features can all be changed without sophisticated knowledge of web technologies. Powerful features like a comprehensive Product Catalog with substantial marketing tools, advanced search tools, and informative visitor assistance tools are all available in a fully integrated e-commerce system. Behind the scenes, the Product Catalog allows web marketers like you to organize offerings into logical groupings that are relevant to your product mix. Marketers have complete control to organize products and communicate details without web programming knowledge. Product Categories and Subcategories with descriptions and graphics can be defined. Complete product information can be entered including, name, description, similar products, replacement products, list pricing, promotional pricing, thumbnail graphic, standard graphic, large graphic, manufacturer details, warranty, shipping, handling, weight, Frequently Asked Questions, and product properties. The Product Catalog aids users in locating the products that they’re looking for, reduces frustration, improves their search results, expedites shopping, and ultimately increases sales. For situations where product pricing cannot be communicated to the visitor, products can be made available for quotation only. In these cases, visitors are not presented a price, but are presented the opportunity to request a quote. To the visitor, the Product Catalog looks like a well-organized document. Visitors have the option to browse the catalog the same way they would a printed catalog or the convenience of searching for any text contained in the product detail. Results are presented in a visually appealing, multi-page list that allows products to be further researched or immediately placed in the shopping cart. The Compass Product Catalog offers another powerful option not offered by any other package: Product Property Search. Through Product Properties, products can be further organized by specifications and keywords. Product Properties are created by you and can be practically anything relevant to your products. If used, visitors are presented with an organized list of search options, selectable by them, that directs them to the exact products without guesswork. Any attribute like sizes, colors, materials, and options can be assigned to a product and made available to visitors. Does your customer need to find a large, blue, cotton, button-down dress shirt or 3-millimeter, coarse thread, brass bolt among thousands of products? With the Compass Product Catalog and Product Properties, visitors can quickly find and purchase what they need. The Shopping Cart is an organized list of selected products and requests for quotes. The Stock Keeping Unit (SKU), product name, quantity, price, extended price, pre-tax total, and order instructions are presented in an ordered list. At any time users can adjust quantities or delete undesired items. Visitors knowing the part number for products they desire, can use the Product Quick-Add™ to conveniently enter the SKU and quantity directly into the Shopping Cart without having to click through the Product Catalog. The entire site is designed with selling and self-service in mind. Unlike traditional shopping carts that forces buyers into a restrictive checkout process that compels them to abandon their cart and leave the site, Compass Web StoreFront allows users to navigate to any link on the site at any time. As users continue to shop, a summary of the Shopping Cart with a tally of the cart’s items and amount due is always displayed. Through the power and design of the Compass Web StoreFront visitors are in control, gain answers to their questions, select products they need, and enjoyably complete the sale through a user-friendly checkout process initiated by the buyer. Compass Web StoreFront allows for anonymous shopping up until to the checkout process. If the visitor isn’t already logged in, they are requested to do so. If the visitor doesn’t have an account, they are prompted to create one at that time. For e-tailors that restrict access to their products and pricing, browsing of the Product Catalog can be restricted to authorized visitors. The Checkout Process consists of three simple steps: shipping, payment, and submission. At every step, the visitor confirms the default values saved with their account, selects from a list of values saved with their account, or enters new information. The final step allows the visitor to review the order, then receive confirmation of it’s submission. The Compass Web StoreFront remembers returning visitors information and checkout preferences. For returning customers, the checkout process is faster than a local trip to the grocery store. The Compass Web StoreFront offers flexible shipping and payment options. As the administrator, you are in complete control of the carriers, terms, rates and handling charges. Shipping can always be charged, not charged if a minimum order level is reached, or never charged, ultimately down to the product level. The Compass Web StoreFront automatically calculates charges as defined by you and incorporates them into the sales order total. Payment is just as accommodating. Payment terms include prepayment, COD, electronic payment, and even net credit terms. For electronic payments including credit and debit cards, the entire verification, authorization, and charges can be automated. 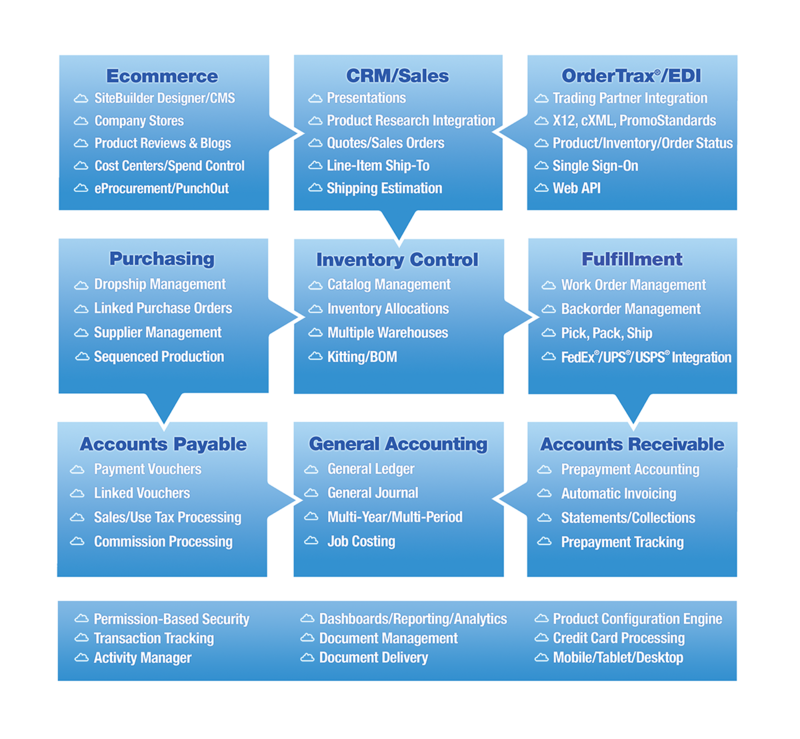 As part of the Compass Operations Management System, comprehensive, fully-integrated product inventory, fulfillment, backorder, and shipping management are optionally available for the Compass Web StoreFront. Through Compass Inventory stock is automatically allocated to a web sales order when it is submitted. Through Compass Fulfillment web sales orders can be fulfilled and shipped. Stock is automatically reduced as fulfilled and the backorder status for undelivered items is maintained.